Native American Smudging. Discover facts and information about the culture of Native American Indians and their Smudging herbs, rituals and ceremonies. Definition of Smudging: What is Smudging? Smudging is a traditional Native American method of burning sacred herbs to produce a smoke cloud which is used in various cleansing or prayer ceremonies and purification or healing rituals. During the Smudging ceremonies and rituals the smoke may be fanned over the person by the Shaman, Medicine Man or healer either using the hand, feathers or a fan. Smudging is the ritual cleansing of the mind, body and spirit. 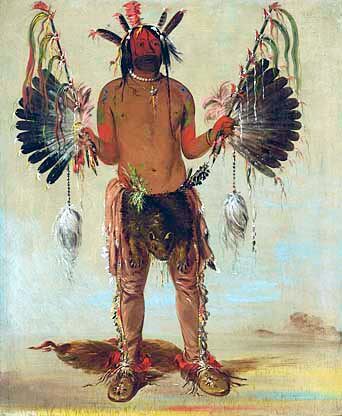 The above picture depicts a Medicine Man with his smudging fans. Originally the herbs were placed in special herb bowls and burned. The dried herbs were then tied into easily portable bundles called 'Smudge sticks' and were included in the contents of Medicine Bags. The Smudge Sticks used in Native American smudging rituals include herbs such as Indian tobacco, sweetgrass, sage and cedar (often referred to as Juniper). Smudging is a traditional Native American Indian method of burning herbs to produce a smoke cloud which is used in various cleansing or prayer ceremonies and purification or healing rituals. Cleansing rituals involving smudging often initiates healing sessions. The process of smudging enhances sensitivity and in some instances alters the state of consciousness enabling a Shaman, or Medicine Man, to assess and treat an illness. Smudging were an important place in Native American Spiritual Healing. The smoke was believed to disperse impurities allowing the healing process to commence. As the smoke rose it was believed that prayers would also rise to the Spirit World and negative thoughts and emotions were lifted away. Most of the herbs for smudging have antiseptic qualities and the process of burning herbs really does purify the air. Smudging rituals and ceremonies include rites of passage such as the Vision Quest and precursors to ceremonies such as the Sun Dance. The smudging rituals and ceremonies that involved healing were used in conjunction with various Native American Herbal Remedies. The Native American herbs for Smudging included tobacco, sweetgrass, sage, sagegrass, yarrow and cedar (often referred to as Juniper). Sage: White Sage (Salvia apiana) & Sage (Salvia officinalis) are used as healing herbs and in Herbal Remedies. The word 'Salvia' derives from the Latin "salvare" which means "to feel well and healthy, health, heal" referring to the herb's healing properties. Sage was used for smudging sacred space. The main Native American herbs used for Smudging were also supplemented by the addition of strong aromatic herbs which had strong cleansing, purification properties and many also had healing properties - refer to Herbal Herbs. Burning wood, or herbs, was a method of aromatherapy used by Native American Indians in Smudging rituals. Cedar Leaf essential oil (also called Thuja Oil) is steam-distilled from the fresh leaves and twigs of the Thuja occidentalis, a slow-growing, narrow conifer. 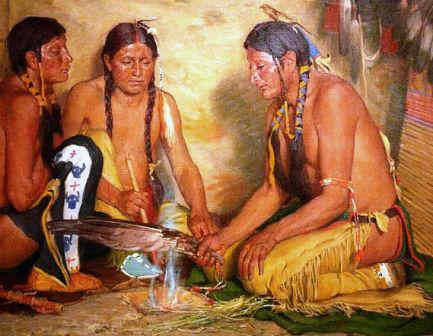 Smudging Rituals Discover the vast selection of pictures which relate to the History of Native Americans and illustrate many decorations and tattoos used by American Indians. The pictures show the clothing, tattoos, war paint, weapons and decorations of various Native Indian tribes that can be used as a really useful educational history resource for kids and children of all ages and a means to study their interpretation. 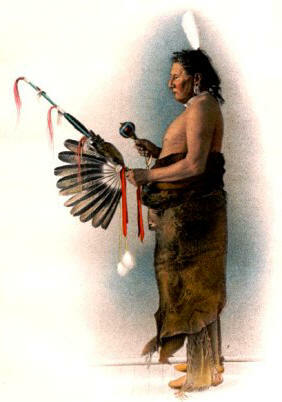 We have included pictures to accompany the main topic of this section - Native American Culture. The videos enable fast access to the images, paintings and pictures together with information and many historical facts. All of the articles can be accessed via the Native Indian Tribes Index.